Long o word families – 8 free read ‘n stick mats! Looking for some learning centers to help your child(ren) master the long o word families? Here you are! My Five loves doing Read ‘n Stick Mats. He’s become proficient at the short a, short o, short e, short i, and short u mats. Now that he can read simple short vowel words automatically, we’ve moved on to long vowel patterns. Why use Read ‘n Stick Word Family Mats? 1) They’re hands-on. My son enjoys reading the words and sticking them to the pictures. 2) The visual aid of the pictures gives an extra clue for beginning readers. It makes the reading task more manageable. 3) They’re vocabulary builders. I’d love to make all eight words familiar ones – like coat and goat. But there aren’t enough of them! The bonus if that your child’s vocabulary expands when you teach him words like moat and gloat. 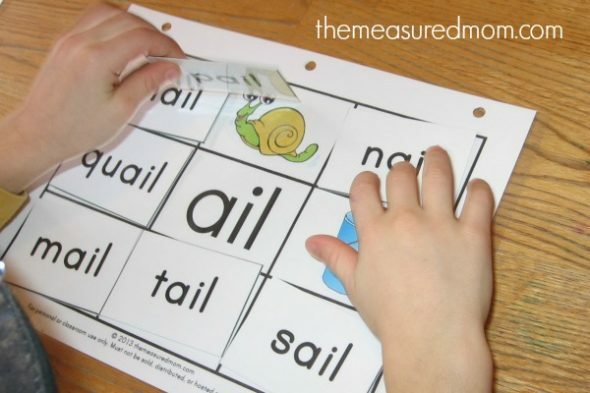 How do you use Read ‘n Stick Mats? 1) Print and laminate each mat on sturdy cardstock. I love this affordable home laminator and laminating sheets! Then print and laminate each set of cards. Cut them apart and stick Velcro dotsto the pictures and backs of the cards. 2) You can certainly print the mats and cards on plain paper, and have your child match them. However, for a more durable and lasting activity, I recommend #1. A bonus of the Velcro dots is that you can store the mats without the cards getting lost — just stick them on! A less expensive and quicker option would be to use sticky putty. 3) My mats were constantly getting misplaced until I punched holes in them and stored them in a 3-ring binder. 4) Take off all the cards. Have your child read the name of the family in the center of the board. Then have him read each card and match it to the picture. You will be teaching new vocabulary along the way when he gets stuck on a particular word (“What’s does gloat mean?”). 5) After a few times of doing this with you, this is something your child might be able to do himself. You can pull out the binder for a reading warm-up before trying some early reading books — or if you’re not there yet, do a few Read ‘ Stick mats after you read books together. You could even put the binder in a bag and bring it along to the waiting room. Thank you so much for the Long O!!! So nice of you to share these with everyone!!! You’re very welcome, Linda! I love that other people can use them too. I’m so glad these are useful for you! Thanks, I will try those with my kiddos. However, am I wrong or the ‘ore’ sound is not the long o? but still the short one. You say ‘store’ or ‘shore’ with the short o. Now, I am not native american, so I might be wrong, but when I say it, it doesn’t sound like a long o.
I think it depends on your dialect. We are in the American midwest, and to use it sounds like a long vowel. However, other people would classify it as an r-influenced vowel. I included it because it was a good pattern to learn, but technically it may not be classified as long o. Thank you so much, I am working with a child who cant say the ole sound and yours is the only suitable thing i have found for him. You do such good things which I recommend to people a lot. I’m SO glad to hear that these are working for him, Margaret! Thank you for passing on my site!